My friend Jennifer writes about national food holiday's, posting a minimum of one recipe a day (sometimes up to 3, depending on the day!). I have enjoyed following her journey over the past 8 months and love all the different daily food holidays. Food holiday's are fun.....but what about an entire month dedicated to one food? July is National Ice Cream Month and Loews Don CeSar in St Pete Beach is celebrating in a big way with a new dessert, only available this month called "Sundae Brunch". 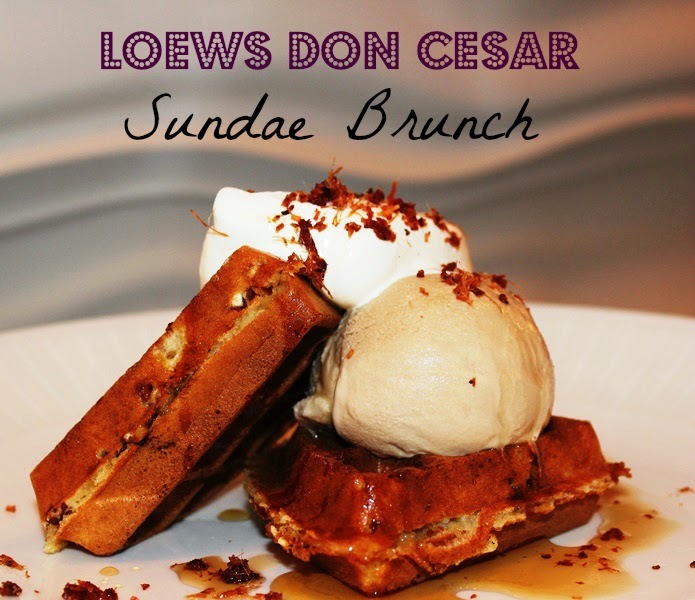 Chef Kenny Hunsberger of Don CeSars Sea Porch Restaurant created a unique twist on the classic ice cream sundae. Featuring Praline Pecan Waffles, Candied Bacon Dust, Bourbon Maple Syrup, Mascarpone and Java Ice Cream. During my visit to Don CeSar last month, I was introduced to "bacon dust" - you have to try it for yourself - #amazing. Combine all ingredients and spread evenly on a silpat or baking sheet that has been sprayed with nonstick spray. Bake at 350 degrees for 10-15 minutes until pecans are dry and crystalized. Lay bacon slices on a silpat or baking pan sprayed with nonstick spray. Combine brown sugar and pepper and thoroughly coat each slice of bacon. Bake at 300 degrees until bacon is crisp. Cool completely before removing from pan. Place bacon in a food processor or spice grinder and pulse until finely ground. Place syrup and bourbon in a sauce pot and bring to a boil. Remove from heat and stir in butter. Preheat Waffle Iron. Beat eggs in a large bowl with hand mixer until fluffy. Gradually add remaining ingredients and beat until smooth. Spray preheated waffle iron with nonstick spray. Pour batter onto hot waffle iron. Sprinkle liberally with ground praline pecans before closing. Cook until golden brown. Place 1⁄4 waffle in center of plate. Top with one scoop of your favorite coffee ice cream. Place a spoonful of Mascarpone atop the ice cream and top with another 1⁄4 waffle. Drizzle entire dish with the bourbon maple syrup and sprinkle liberally with bacon dust. Aww, thanks for the shout out! I am going out to celebrate when all is said and done. This sundae looks insane and I can't wait to try it on Sunday!